Anatomy is one of the fundamental fields that underlie the study of most subjects in the biological sciences. For example, sciences grounded in gross anatomy such as physical anthropology, biology, and paleontology all rely on the study of the skeleton of humans, primates, other mammals, and lower vertebrates, and these studies also form the basis for much of medical science. Until recently, learning anatomy was literally a "hands on" experience, with students studying, measuring, and comparing actual skeletons during their laboratory sessions. Recent advances in three-dimensional digitizing hardware and software now make it possible, practical, and economical to scan complexly shaped skeletal elements and archive these materials in a digital library that in turn can provide broad access for study and research. These materials can easily include a full range of separate skeletal elements from a variety of large and small sized species as well as elements linked together and animated as joint complexes. 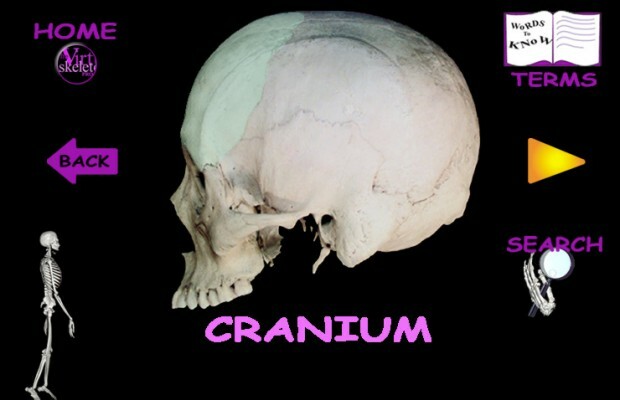 The e-Skeletons digital library will have wide ranging educational implications because it will make a broad range of study and research materials available to students of anatomy hailing from a wide number of disciplines, across the K through grey levels. One of the important goals of educators is to attempt to ensure that all of our students have the best possible access to the resources that form the foundation of their learning experiences. The study of the skeleton is one topic that has, historically, been critically dependent upon the availability of actual skeletons for study. Although much of this study is based on either black and white or color photographs and drawings, studying actual skeletal elements is an essential component because it is in this way that the two-dimensional experience is elevated to the three-dimensional (Figure 1). The quality of the learning experience is therefore controlled in large part by access to the skeletal material. Some institutions have excellent skeletal collections, with some schools having enough extra material that students can check out a skeleton for home study, while other institutions have no teaching material at all. In the latter case, students are forced to base their study of the three-dimensional form and function of the skeleton on two-dimensional pictures from their textbooks. Clearly, there is little comparability between these two learning experiences. Figure 1. 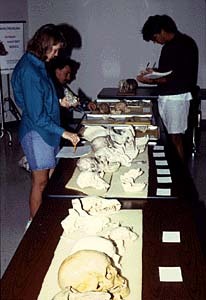 Students in the introductory course in physical anthropology at the University of Texas have access to a wide variety of skeletal materials. These materials are, however, limited in number and can be used only in a supervised setting. Advances in three-dimensional data capture, display and software learning interfaces now make it possible to build a digital library of the skeleton that will serve to even out the disparities that exist among the learning experiences of students from different institutions. In 1998, we received funding from the Digital Libraries Initiative Phase 2 of the National Science Foundation for the proposal, "Virtual Skeletons in Three Dimensions: The Digital Library as a Platform for Studying Anatomical Form and Function." The sections that follow detail our efforts during the first of two years of support under this proposal. The web site for this project is located at <http://uts.cc.utexas.edu/~vskel/>. There are numerous methods now available for digitizing both the external and internal surfaces of three-dimensional objects. Some of the most useful technologies for digitizing skeletal materials are three-dimensional laser scanning and high resolution X-ray computed tomography (HRXCT). Both technologies are ideally suited for this task because of their noninvasive and nondestructive natures. These technologies are presently available on the University of Texas, Austin campus in the Physical Anthropology Computer Imaging Laboratory and the High Resolution X-ray Computed Tomography Laboratory. Some of the most recent advances in automated 3-D imaging incorporate a laser to capture the surface topography of a specimen. These scanners differ from computed tomography (CT) technologies because, in general, only the geometrical coordinates of the outside surface can be gathered. Laser surface scanners offer advantages over medical CT scanners when only surface coordinates are needed because these scanners generally do not require proprietary software, but produce data sets that can be analyzed on any personal computer platform with a variety of "off the shelf" software. Operating costs are much lower than CT because laser scanners use standard electric current, have very low maintenance costs, and do not require a licensed operator. There are many stylus operated 3-D surface data gathering systems on the market, but these are generally fairly slow, non-automated, and labor intensive, and vary dramatically in their degree of resolution. The laser scanning technology that we use to capture the surface geometries of the skeletal elements uses what is known as adaptive scanning and is manufactured by Digibotics, Inc. of Austin, Texas <http://www.digibotics.com/>. This system tightly focuses a laser beam and uses this single point of light and a triangulation algorithm to measure the exact x and y coordinates of each point on the surface of the specimen at a fixed z coordinate or level (Figure 2). Figure 2. The Digibotics, Inc. laser scanner is used to digitize the skeletal elements used in this study. In order to eliminate the distortion resulting from mismeasured surface normals, the Digibot II� scanner uses a turntable to rotate the specimen so as to bring each surface into a position that is exactly normal to the laser. Additional rotations of the specimen complete the collection of points around one horizontal contour, and the scan of the specimen is completed by translating the laser vertically though the z-axis and collecting additional contours. This scanning method collects data from convex as well as concave surfaces, and creative mounting of the specimen on the turntable can produce scans of structures such as concave eye orbits. Digibotics, Inc. has recently added a new lens to their system that collimates the laser beam to a much smaller diameter. This option produces a point spacing of 500 mm in the x, y, and z directions, and further increases in resolution are expected. Because adaptive scanning technology collects each point separately, there is no need for sophisticated and computationally time-intensive "zipper" software or additional scans to completely digitize the object. The x, y, z data can be exported to a variety of software programs for wiremeshing and shading. One potential disadvantage of this system is that, because each data point is collected separately, it can take several hours to scan an object at high resolution, and this type of laser scanning is not appropriate for living specimens. These scanners are, however, fully automated and do not require an operator. For the purposes of our Digital Library project, long scans are usually run overnight or on the weekend, and we have now completed scans of every element of the human skeleton (Figure 3). We are now completing scans of the chimpanzee and baboon. Figure 3. This page shows how the individual elements of the skull are illustrated on the web site. The development of X-ray CT began as a medical diagnostic tool in 1971 and witnessed a wide number of applications in physical anthropology. Computerized tomography differs from conventional radiography in that the X-rays are restricted to a plane and the intensities of the beam, before and after it passes through the specimen, are measured. The measurement of a single slice of a specimen is completed by either rotating the object 360� on a turntable, or by rotating the X-ray source itself 360� around the object, with this latter method being critical in medical applications so as to minimize motion sickness in the patient. (This "axial" rotation of the X-ray source around the patient adds the "A" to "CT" to form the commonly used term "CAT" scan.) In order to complete a scan, the specimen is either translated vertically on the turntable or the X-ray source is moved along the long axis of the specimen. Conventional CT has a resolution on the order of 1-2 mm (or more) thickness, and this does limit the imaging of structures that are below this size, but some increase in resolution can be obtained by overlapping closely spaced images. Image reconstruction is completed by using what are usually company-specific algorithms to calculate the linear attenuation coefficient m for each point in the specimen. High resolution X-ray CT (HRXCT), also known sometimes as industrial CT, offers several advantages over conventional medical CT. First, HRXCT uses a range of higher energy sources (typically 125-450 kV) than those available in medical CT, which makes the instrument capable of penetrating much denser objects including rocks and very heavily mineralized fossils. (Of course, these higher intensities also prevent this instrument from being used on living organisms.) Second, the X-ray detectors are modular, and these can be switched between linear and area detector arrays, which increases the resolution of the instrument. The combination of modular sources and detectors produces a CT system that can scan a variety of specimens across a wide range of resolutions. For example, the current resolution available on a medical CT is 1 mm (1000 mm) while that on a HRXCT ranges from 10 mm to 100 mm. This increase in resolution means that much smaller objects or structures such as trabecular bone (Figure 4) can be clearly imaged. One other advantage to HRXCT is that the digital files are not written in a proprietary file format, but are exportable in a variety of formats that are easily accessible on all personal computers. Together these advantages combine to make HRXCT very useful scientifically. An HRXCT laboratory has recently been established at The University of Texas at Austin (Figure 5) <http://www.ctlab.geo.utexas.edu/>. This laboratory became operational in early 1997 and is available to the research community. The HRXCT instrument is designed by Bio-Imaging Research, Inc. (Lincolnshire, IL) and includes 200 kV and 420 kV sources as well as linear and area detectors that offer a resolution down to 10 mm. Images can be written in a variety of file formats (e.g., TIFF, BMP, TARGA, PICT, etc.) and on a range of media (e.g., optical erasable disks, CD-ROM, Zip or Jazz disks, DAT tapes) that can be accessed by all platforms of personal computers. Figure 4. HRXCT can be used to illustrate the anatomy of trabecular bone found within the ends of long bones. Figure 5. A view of the HRXCT laboratory at the University of Texas at Austin. Many of the digitizing technologies discussed above come directly from the fields of computer-aided engineering and manufacturing. In fact, many laser scanners are specifically designed for reverse engineering and computer-aided manufacturing (CAM). Once these skeletal elements are digitized, it is useful to think about the remaining option of outputting these data back into three-dimensional models for study by a range of students who would not otherwise have access to the materials. The three-dimensional printout technologies fall under three general categories: automated milling, stereolithography (STL), and laser sintering. In each case, the digitized object is written to a file format that computationally "slices" the object into thin layers. The x, y, and z coordinates of these layers are then used to produce the 3-D printout. Automated milling physically sculpts the object from wood or Styrofoam. Stereolithography builds the 3-D object layer by layer by curing epoxy, but this is often a time consuming process. Laser sintering, a process invented by DTM, Inc. <http://www.dtm-corp.com> is the newest addition to this line-up of technologies. This process uses a laser to sinter or fuse nylon or plastic powder into the first layer of the object, which in turn is sintered to the next layer, and so on, until the 3-D printout is completed (Figure 6). Laser sintering is a relatively rapid process, and new research is focused on using more powerful lasers to sinter ceramics and metals so as to transform sintering into a rapid manufacturing process. 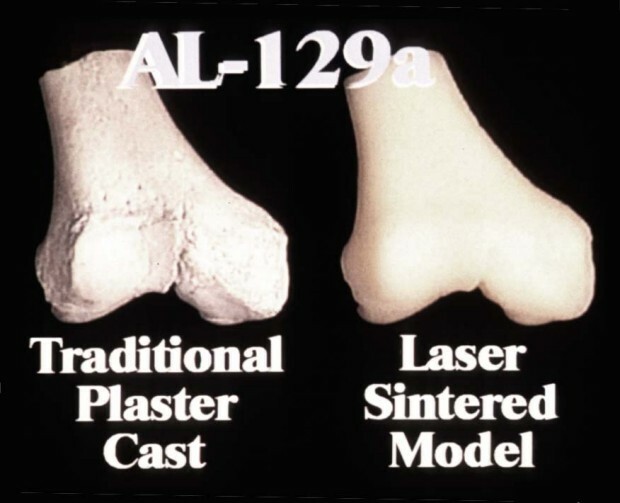 Although laser sintering is relatively expensive at present, it is likely that at some point in the future, this technology will offer a valuable means for getting replicas of rare, fragmentary, fragile or even endangered specimens into the hands of the students. Figure 6. On the left is a plaster replica of a fossil specimen, while on the right is a laser sintered print out of the same specimen. Archiving skeletal objects themselves as raw data to the web with no informative or comparative context may prove useful to some advanced users, but a software interface that serves to teach identifications, comparative morphology, and anatomical function will certainly serve to extend the benefits of these data sets to a much larger number of users across all educational levels. We have designed an interface that uses an image of the skeleton as a "map" and organizes the skeletal material by anatomical region (e.g., head and neck, lower extremity, etc.). Each region includes color images of each element taken from the six standard anatomical views. Each skeletal element has color overlays of muscle origins, insertion, and joint surfaces that can be turned off and on by the user (Figure 7). Higher levels of detail will include selective HRXCT scans of particularly important anatomical features or elements. Figure 7. This page shows the navigation buttons and the use of overlays for a single skeletal element. Up to this point the software interface bears a very close resemblance to what the typical student would encounter in a hard copy printed book. Where this digital library begins to depart from the typical anatomy book is with its emphasis on the three-dimensional presentations. Each skeletal element has both QuickTime� and VRML animations. The former animations are preset and include rotations around the standard anatomical axes, while the latter files provide the user with complete control over the anatomical materials. The VRML files require a more powerful CPU than do the QT animations and can probably only be accessed by advanced users. During the second year of the grant, we intend to post skeletons of the chimpanzee and baboon to the web site. These materials will provide an important comparative context for the human skeleton. We believe that the interface that we have built will easily accommodate other species as well, and we anticipate that, in future years, the site will be expanded to include other mammalian species as well as other vertebrates. A critical component of the user program interface will include self-evaluation and will build on work that is being carried out under a current National Science Foundation grant, "Developing Computer-Based Multimedia Examination Formats for the Sciences" (see <http://www.dla.utexas.edu/depts/anthro/kappelman/vexams/vexam.html>). Virtual examinations draw from the full range of materials, and are presented to the student in the form of multiple choice, matching, and interactive problem solving questions. The questions are integrated with 2-D images, video clips, and 3-D animations. VExams� can include "linked and looped" as well as "expert-nested" questions that truly evaluate the exact level of each individual student�s expertise. Grades are automatically calculated and reported as the last screen of the exam for immediate feedback to the student. This latter project also receives support from the Intel Corporation (see <http://www.utexas.edu/computer/itc/intel>). The primary audience that this project is aimed toward is that of college and university students, but we anticipate that the full range of K through university, as well as life-long learners, will use the web site. There has, however, been a great deal of interest expressed by potential users at the high school and middle school levels. In order to respond to this perceived need, we have designed a parallel user interface that is aimed more directly at the middle school student. This portion of the web site uses the same basic anatomical data but has a more "kid friendly" interface (Figure 8). It will also include a number of classroom exercises that instructors can print out for class activities. Figure 8. The web interface for the kids section of the web site includes the same basic anatomical data but is presented in a "kid friendly" manner. One of the critical issues that has to be addressed is how to handle the delivery of these large databases to the users. At present the web works quite well for the presentation of text and images, but the animations and raw data sets are generally too large for rapid delivery over the web. We are currently experimenting with a CD-web hybrid programming interface that posts the program instructions to a web site and delivers the raw data files to the user via a CD ROM (see <http://anthropology.wadsworth.com/toplinks/cddemo.html>). This delivery system effectively circumvents the unacceptably long download times across low speed networks. In addition, a separate CD that includes the same information as the web site will permit the user to access the anatomical data when they do not have web access. Recent advances in three-dimensional digitizing hardware and software now make it possible, practical, and economical to scan and archive complexly shaped objects in a digital library for study and research, and thus expand the digital library well beyond its traditional holdings of hard copy text, images, and video. Anatomical materials can easily include a full range of separate skeletal elements from a variety of large and small sized species, as well as elements linked together and animated as joint complexes. Archiving anatomical materials to a digital library will have wide ranging educational implications because it will make a broad range of study and research materials available to students of anatomy hailing from a wide number of disciplines, across the K-12 to graduate school levels as well as life-long learners. Providing broad access to critical materials that are otherwise unavailable to students is one of the central goals of a national digital library. We would like to thank Stephen Griffin of the Division of Information and Intelligent Systems (IIS) and Frank Wattenberg of the Division of Undergraduate Education (DUE), both from the National Science Foundation, for their support of this project under the Digital Libraries Initiative Phase 2 (IIS-9816644). Dean Sheldon Ekland-Olson (now Provost) and Associate Dean Brian Roberts of the College of Liberal Arts at the University of Texas have provided critical support for this project, and their assistance is greatly appreciated. Our various colleagues at UT Austin have also provided assistance and support for this project, and we would like to thank Claud Bramblett, Bill Carlson, Matthew Colbert, Marsie DeOliveira, Nicole Drane, Adam Gordon, Richard Ketcham, Tim Rowe, Robert Scott.